Our next stop was Airlie beach. we arrived here later than scheduled due to the cyclone weather, and fortunately managed to re schedule our Whitsundays tour at no extra cost. We arrived here at eight o'clock in the morning and found our room wouldn't be ready until about midday. so we set off exploring and also checked in for our Whitsundays tour. The next day, we met up with our group and set off on our catamaran boat on our two day two night trip of the Whitsundays. The first couple of hours were pretty horrific for me, as I quickly realised that with the rough sea, following the bad weather, I actually suffered from very severe sea sickness. so my first couple of hours were spent in the toilet, rather than getting to know the people on the boat. I quickly recovered when we moored in a bay for then night, and even managed dinner. The following morning, after a pretty restless night we were up early, fed and set off to Whitehaven beach? Whitehaven beach was stunning, I quickly put on my stinger suit and headed into the water. The fear of being stung soon vanished and I enjoyed the coolness of the ocean. Following Whitehaven beach, we set off for some snorkling. After a bit of getting used to the snorkel and breathing, it was amazing to see the Great Barrier Reef from this angle and all the fish and turtles were fantastic to see and swim with. Swimming around and looking down to a turtle nearly the same size of me was both amazing and scary though........the rest of the day flew by and I looked forward to my first attempt at paddle boarding in the morning. The following day, paddle boarding was amazing, I thoroughly enjoyed it and felt so free standing on the board in the middle of the water with only a paddle to get me moving. Following this it was into the see through kayak with Allena for a paddle around. This was also lots of fun, once we got in sync with each other, there was no stopping us. After lunch we had another opportunity to snorkel, then headed off to dry land. I was relieved to get back in to land, so as not to feel sick. I really enjoyed my trip around the Whitsundays, and would recommend this to anyone spending time in Australia. 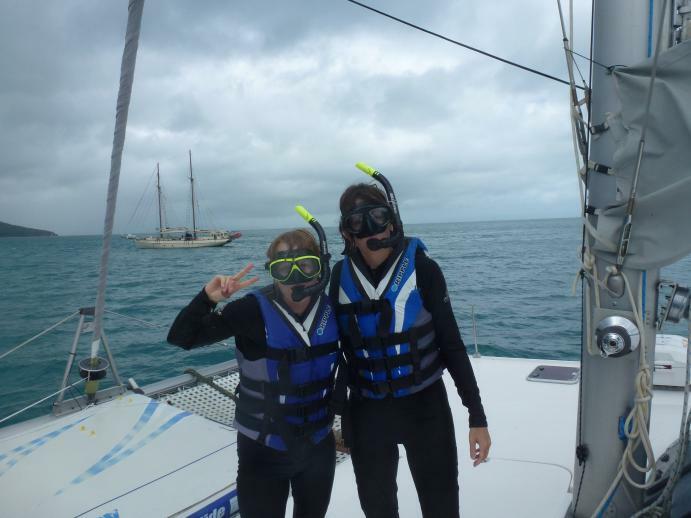 Unfortunately the rest of our time in Airlie beach had pretty horrid weather! and we looked forward to our next destination Townsville, which has far nicer weather.